The Island Cove Park in the foreground is listed for sale at $6.75 million. It is one of Durango’s oldest mobile home parks and provides workforce housing with riverfront views. Island Cove Park residents Cody Reinheimer, center, with his 10-year-old daughter, Kiva Reinheimer, upper left background, live in the trailer to the left. 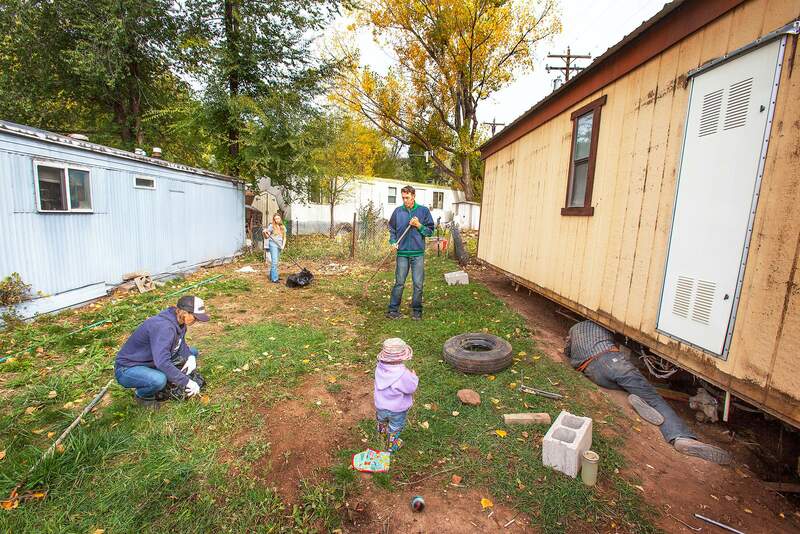 They were helping their neighbors Laurel Foster, lower left, 15-month-old daughter Mayann Foster and Nichols Foster clean the lot where they have put their newly purchased mobile home. One of the oldest mobile home parks in the city of Durango is for sale, drawing interest from high-density residential developers eyeing the site’s prominent location along the Animas River. Island Cove Park, on Florida Road near Chapman Hill, has been on the market since June. It is listed at $6.75 million. It is widely regarded as one of the last developable sites along the Animas. The mobile home park was founded about 40 years ago by the Kill family, which still owns and manages the property. However, Cynthia Roebuck, an agent for the family, said Louis Kill, who founded the site, recently died, and his heirs are now looking to sell. There are about 75 mobile homes and apartments on the 17-acre property. But given the site’s unique and desirable location along the river, developers in the market are looking at more profitable uses. Russ Smith, a real estate broker for Keller Williams handling the Island Cove Park sale, said the property is not under contract, but he has been contacted by several interested buyers. The property is zoned Residential High, the city’s most dense residential zoning, which allows 12 to 24 units per acre. Although officially listed as a 17.56-acre site, there are restrictions with the land configuration, so not all that property is developable. “Whoever wants to develop would have to provide information on slopes, floodway, open space, and from that determine what’s eligible for building,” said Nicol Killian, planning manager for the city. Killian said she has talked with some developers in relation to the Island Cove Park but nothing outside of general questions about land use. Most interested buyers have expressed a desire in constructing condominiums or some sort of high-density residential complex, she said. 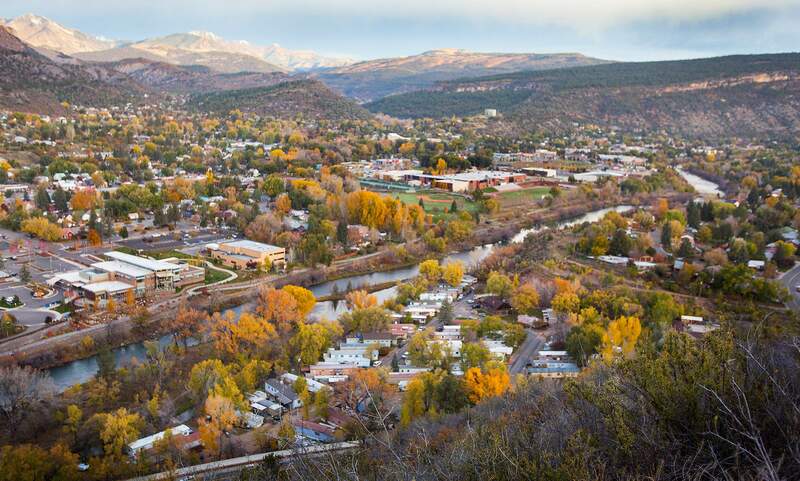 Per city code, Killian said any development project with three or more units for sale is required to provide a percentage of those units as affordable housing, or pay an in-lieu fee to help fund affordable housing projects/programs in the city of Durango. Island Cove Park offers some of the most affordable housing within city limits, with rents for trailer space ranging from $500 to $600 a month. Apartments on the property go for a little more than that. All of the tenants at the mobile home park have been notified the property is for sale, Smith said. Most of the renters own their mobile home, and it is unclear where they could end up. Within city limits, there are only three mobile home parks, including Island Cove. At Westside Mobile Park, on U.S. Highway 160, rent goes for about $425 a month, but a manager there said there are currently no vacancies for those who own their own trailer. Sheryl Ayers, a former La Plata County commissioner, has long maintained the importance of mobile homes in the community. She and her husband first lived in a mobile home before purchasing a “stick-built” house in Hesperus. Durango is known for its expensive real estate market. The opening of Lumien Apartments, along with 11 other planned affordable-housing projects, could provide some relief. But many still struggle to pay rent, forcing potential renters and homeowners to look elsewhere. And that’s a problem, Ayers said.